Meet the naughtiest dino that anyone knew. What was his hobby? He loved saying BOO! A super-simple story full of dinosaurs, giggles and rhymes. Laugh louder than a T-Rex roars. For over 20 years, lucky readers have chuckled at the funny critters in Dinosaur Roar! But what if you’re not a reader yet? Does that mean missing out on the fun? Not anymore! 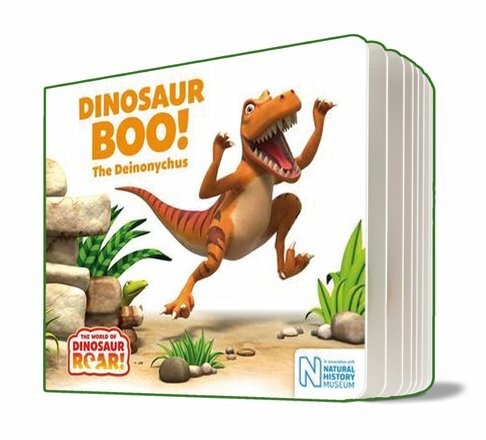 Say hello to this new series of short tales for tiny tots, based on the original Dinosaur Roar! story and written by top author Jeanne Willis. Simple rhymes, bright pictures and heaps of funny dinos to get you ROARING with laughter!